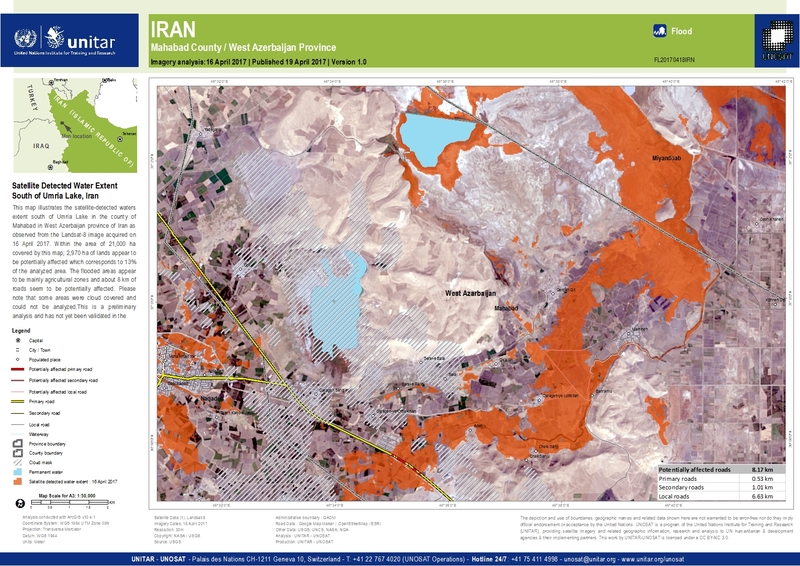 This map illustrates the satellite-detected waters extent south of Urmia Lake in the county of Mahabad in West Azerbaijan province of Iran as observed from the Landsat-8 image acquired on 16 April 2017. Within the area of 21,000 ha covered by this map; 2,970 ha of lands appear to be potentially affected which corresponds to 13% of the analyzed area. The flooded areas appear to be mainly agricultural zones and about 8 km of roads seem to be potentially affected. Please note that some areas were cloud covered and could not be analyzed.This is a preliminary analysis and has not yet been validated in the field. Please send ground feedback to UNITAR - UNOSAT.